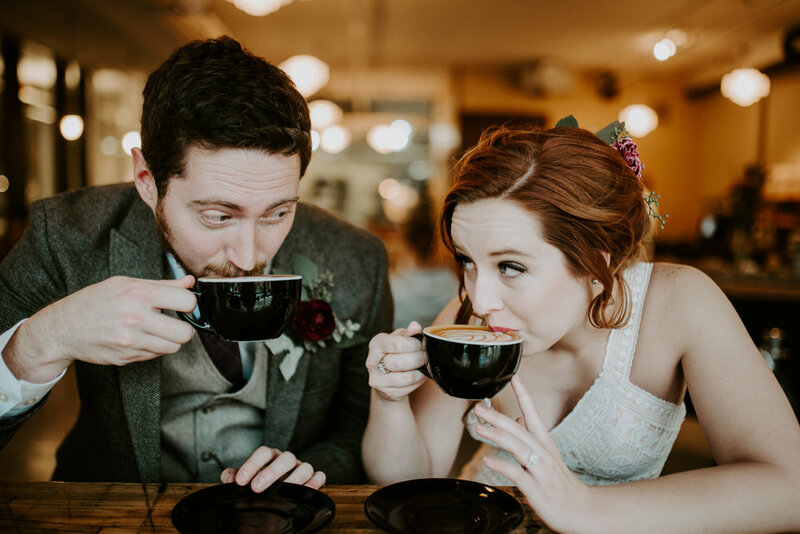 November 25th, I had the huge honor of being Justin and Montana's Wedding Day photographer in their beautiful boho wedding nestled in the heart of Downtown, Oklahoma City. When I first arrived to A Loft hotels, a mixture of succulent arrangements from the talented Heather Hayes with Everything Beautiful OKC and stunning wool suit jackets tuned me in this would be a fantastic wedding to capture. Montana and Justin, with their wedding party and family, were warm and welcoming, immediately filling me in on everything from the rehearsal dinner to the fun games they played earlier that morning over mimosas and laughter. After getting ready, we headed over to the stunning venue Plenty Mercantile to get ready for the ceremony and reception. Boasting a one of a kind view of the Downtown skyline, as well as one of the most unique and well-done aesthetics in OKC, Plenty was the perfect backdrop with their red brick indoors and mixture of rustic wood and brick on their balcony. After finishing up with family photos, I quickly realized that I had two full hours with Montana and Justin, thanks to some amazing planning on behalf of OK Social Events. Together, Montana, Justin, and I wandered around Automobile Alley capturing images of them with all sorts of eclectic backgrounds. From the Airstream they rented at Rent My Airstreams to the beautiful dome of Frontline Church, we found all sorts of beautiful locatoins on our walk. After countless laughs and stories told, I looked at the time and got one of those random ideas that area usually great or terrible (though this time coffee was involved so it couldn't have been that terrible). We ended up at Coffee Slingers sipping on lattes and laughing at the countless looks we were getting from its patrons. After we got our lattes, it was time to head back to Plenty and get the show on the road. A beautiful ceremony was held, followed by a party that lit up the Oklahoma City sky. Austin Smith Events did a fantastic job as the MC of the night, keeping the dance floor filled with laughter and smiles. A food truck from Holey Rollers brought in some tasty desert for everyone to enjoy. Montana and Justin were one of the most fun couples to work with. Initially hesitant about how active they wanted everything photographed, we broke that ice quickly in the day and ended up laughing and capturing silly images throughout the day. They were an absolutely stunning Bride & Groom and planned a gorgeous day through and through. The incredible list of vendors made my job a breeze, and this wedding won't be one I will ever forget!